Once you make a decision, the universe conspires to make it happen. - Ralph Waldo Emerson - Gateway to Canada | Canada Immigration Consultancy! Mr. Aries Dacir, a Certified Public Accountant, attended one of my seminar schedules in Angeles City. Right there and then, he decided to get our services to help him on his application for Permanent Residence in Canada. A decision he did not regret. 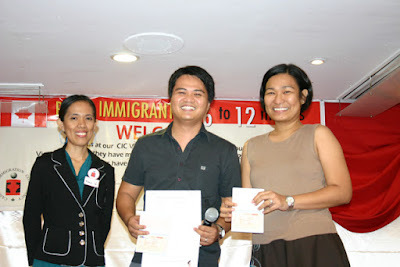 We filed his application last year and just recently, he was one of those who attended our monthly immigrant visa party! He and his wife will be moving to Canada few months from now. Click here to reserve a seat. See you there!